We’ve met with hundreds of companies and prepared almost as many pitches ever since we started. While each of them was unique in their own way, we keep getting asked the same question over and over again, even after a successful campaign. How can we leverage the Internet to grow our brand? That’s alright, 52% of Chief Marketing Officers (CMOs) in the US aren’t sure either (and another interesting statistic from the same report – 66% of all marketers think companies won’t succeed unless they have a digital marketing approach). So what happens here is that companies will employ the ‘flavour-of-the-month’ marketing tatics based on what they’ve read in the news or what their friend / colleague / mother said. Everything is disjointed and you end up working with too many different vendors, resulting in confusion and inconsistent results. Sometimes it works, sometimes you’re not even sure if it worked or not, and at other times, it fails spectacularly. But from the lack of a better alternative, you keep going through the same process over and over again. We’re here to fill up that big gaping hole in the market that’s causing business leaders and managers so much pain. At CloudRock®, we employ many different strategies, from search engine optimisation to website usability testing to pay-per-click to ensure that your web marketing dollars are providing a positive ROI. We make it work because we spent years coming up with the CloudRock Digital Marketing Framework. It ties in all the disparate tactics you can engage in into one coherent, unified digital marketing strategy. Furthermore, measurement lies at the heart of what we do, which is why we do it so well. By executing on scalable strategies and tactics, we can give you results that drive even more informed marketing decisions. That’s not to say that tactical approaches never work. Of course, they can. Here’s a quick guide to help you decide which one might work best for you. You already have an Internet marketing strategy in mind and need to find trusted specialists to help you execute on various tactics. You’ve already drawn out your buyer personas, have an established sales funnel, have crafted compelling messaging for your brand, mapped your content to your buyer journey, know what analytics to measure that makes sense and so on. You have access to a limited budget, and can only afford to execute well on one or a handful of tactics at a time. You’re looking for a ‘proof-of-concept’ tactical campaign to prove to management (or yourself) that digital marketing will work for your business. If you’re looking for more tactical approaches, here are a few of our standalone services. You already know that the Internet is an important channel for you and understand the importance of an integrated digital marketing strategy. You want to ensure that every tactic you execute online is tied together to your overarching brand goals. It’s important that there are no gaps in your digital marketing activities so that your competitors can’t catch up or overtake you. You want clear, measurable results and outcomes so that you know what works for you and what doesn’t, allowing you to improve and grow over time. Should I Bring this In-house? Of course, you could, and that’s a question that we encourage you to fully explore yourself before approaching us. That’s easily a cost of over $25,000 a month, without taking into consideration all the other ancillary costs of onboarding and managing new staff (of course, you might get lucky and manage to hire one person with all those skill sets. Send us a photo – such a marketing unicorn is rare in the wild). No wonder most companies have a problem fully taking advantage of digital marketing channels and achieving a respectable ROI. Even within large organizations with the budget to spare, there are still inherent problems. Digital marketing is one of the fastest changing industries in the world. Companies like CloudRock have to adapt to the changes fast for the simple reason that that is what we’re supposed to be experts in. In-house teams are understandably less sensitive to these changes. Additionally, in-house teams typically suffer from resource allocation issues, inadequate tools, unperfected processes and other internal issues that prevent them from properly implementing the strategies they wish to either test or perfect. Besides, marketing teams in Malaysia are notoriously small, and most don’t have a dedicated digital marketer. Your overworked marketing team will barely be able to keep up with their current workload, much less the manic pace of digital marketing. Professional athletes have many things in common – they hire coaches, nutritionists, doctors, agility specialists, personal trainers and other resources in order to maintain their competitiveness. Hiring CloudRock can help you scale your business quicker, execute faster, and produce results that can’t be matched internally. Other digital marketing agencies will give you a menu of services to choose from (SEO, PPC etc), but won’t help you plan the whole meal. We provide a true one-stop solution for your entire digital marketing strategy. When you ask an SEO or PPC company what else you can do, their go-to response would be ‘increase your targeted keywords’ or ‘increase your ad spend’. We don’t blame them – without a holistic framework in which to place all these tactics in their place, you can’t adequately strategise. Even if you do decide to start off with on tactical campaigns, you can feel confident that we have a ready roadmap for you to help you grow. As long as there’s a good cultural fit between us, you can be certain that we’ll be the perfect partner for you. 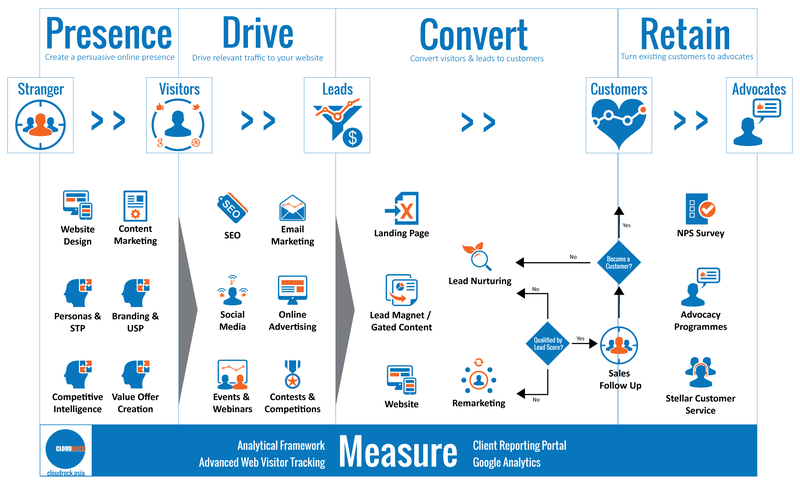 What does CloudRock’s Digital Marketing Framework Look Like? Now that you understand the importance of a strategic approach to Internet marketing and appreciate how working with us might help you, you might be interested in taking a look at our framework. CloudRock®’s Digital Marketing Framework is persona and content-focused, which means that we look at your buyer’s journey to determine what kind of information we need to place in front of them in order for them to work with you (in case you haven’t gotten the memo, buyers are now in control of the buying process, with between 57%-70% of the purchasing process completed before they contact you). It took us a while, but we have managed to make it scalable. Whether you’re an established SME looking to explore digital channels or a brand that wants to get serious about your Internet marketing, we can make it work for you. What Business Outcomes Can You Expect? Your company has an effective Internet marketing strategy, bringing it in line not only with with modern digital marketing practices but your competitors’ marketing efforts. You have a measurable roadmap that will help you improve your digital marketing efforts over time. You gain a valuable marketing partner that’s invested in your success. You gain the flexibility to leverage on sudden environmental changes or market opportunities for ad hoc campaigns and/or promotions at a moment’s notice. Your budget forecasts become more predictable. You not only gain additional leads and revenue, but a deeper understanding of where and how these leads come from, enabling you to better plan for faster growth.